Ever since he dropped Murs 3:16 - The 9th Edition with 9th Wonder in 2004, Murs has gained a cult following. He is considered to be one of the better story-telling rappers in the game, displaying an incredible ability to paint vivid pictures of street life and, quite simply, life in general. The classic song "Walk Like a Man" off of the aforementioned '04 album is a perfect example of this. Clearly, pressure does not bother Murs (or 9th Wonder, for that matter), as despite the heavy expectations placed on his follow-up to Murs 3:16 - The 9th Edition, Murs comes through with authority, once again exhibiting impressive story-telling skills and solid lyricism on the 10-track album, Murray's Revenge. Produced entirely by 9th Wonder, Murray's Revenge, though not as highly regarded as Murs 3:16 - The 9th Edition by most (I do not include myself in that group, though), is close to a masterpiece. Murray's Revenge opens up with a short but solid banger as Murs makes his intentions known immediately: "Now my day in the sun has come, the one chosen to break up the ice that got the rap world frozen." Break that ice, Murs; break it. I have to admit that I wasn't too crazy about this track, as the beat sounds way too conventional (you'll know what I'm talking about if you listen to the song). It's fairly short, too, so there really isn't much to say about "Murray's Law." It's still worth a listen, though. That brings us to the best track on Murray's Revenge, "Silly Girl." While the title may sound, um, stupid, it is actually a very well put-together (and easily relatable, and that's what makes Murs so good) song that tells the story of a boisterous ex-girlfriend that will not leave Murs alone. 9th Wonder's beat is nails, and Joe Scudda makes an appearance and drops a verse. I guess "Silly Girl" kicked things off, because now, things are getting good. "Barbershop" is one of the stronger records on Murray's Revenge, showcasing a laid back beat and, on that same token, laid back rhymes from Murs. Murs is not going to blow you away with an advanced vocabulary like Canibus, but what he lacks in word variety he makes up for in tone: "And I ain't about to argue, shoot game with you punks, who don't know Air Jordans from some Reebok Pumps." Rapper Big Pooh stops by on this track, too. It might sound similar to "Murs Day," but "Yesterday & Today" is a better track overall, as Murs discusses the struggles of everyday life of a hustler-turned-father. The concept feels redundant, but in Murs' world, no can should be left unopened: "You know them days you just got the blues, all stressed and depressed from just watchin' the news, no matter what good you do it seems you always get screwed, got you caught up in your feelings now you off in the mood." 9th Wonder lays out some banging drums for Murs on this beat, and Murs obliges with some more of that good old hustler talk: "Dropped out of school, no G.E.D, but in these streets I'm a G-O-D, enemies tell they B.G. stories 'bout me, a nightmare, when I'm off that P, that's why they always run when they see me in the street, known to beat 'em down, straight take they heat." Solid track here. This does not sound like a typical 9th beat as it contains a country-like twang, but it's a welcome change and, consequently, one of the best songs on Murray's Revenge. You can guess by the title of the record that "L.A." is a west coast anthem. Think of it as a rated G version of "Straight Outta Compton." The romantic side of Murs appears yet again on "Love & Appreciate," although this time it's more of a love ballad rather than a plea for a girl to get lost. "You wonder who I’m seeing, and I’m wonder who you’re seeing, but we too afraid to ask cause we both got our demons." Now, seriously; who hasn't been through that before? This is kind of a lame concept, but the beat knocks and Murs sounds great over it, so whatever, right? I'm sure you can pretty much guess what the song is about without me telling you. All I know is that it's one of the best tracks on the album thanks to the instrumental. The title track is the second best song on the album behind "Silly Girl," in my opinion. 9th Wonder samples Bob James' "Nautilus" record for this cut, and he does wonders with it. Murs rips off some good lines, too, including: "Quit while you're ahead, you ain't seein no bread and, don't sleep on us, you can sleep when you're dead." 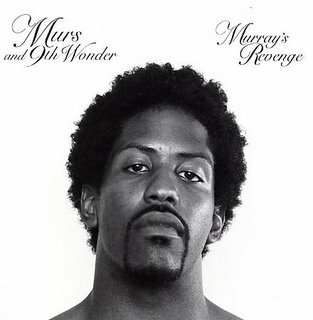 While Murray's Revenge may lack the introspective records that made Murs 3:16 - The 9th Edition so popular, the production more than makes for it. The beat of every track is, at the very minimum, solid, but being that 9th Wonder handled all 10 records, is anyone actually surprised? Murray's Revenge is the perfect album to listen to while you're chilling at the crib after a long day's work. It's relaxing, straightforward, and it isn't very long. Records like "Murs Day" and "Barbershop" represent feel-good songs that you can bump whenever, meanwhile "Silly Girl" and "Love & Appreciate" are almost guaranteed to be relative to something that is/was going on with you and your significant other. Overall, even taking into consideration the fact that I was not too fond of "Murray's Law," it would be very hard to recommend skipping any tracks here. This album is, in my opinion, the best of four full-length projects that Murs and 9th Wonder have put out thus far, the other three being the consistently mentioned Murs 3:16 - The 9th Edition, then Sweet Lord and Fornever. Look forward to each of those being reviewed in the future. As I stated earlier, what makes Murs so likeable is his forthrightness and relatable content. He evokes deep thoughts, yet not too deep where his audience won't be able to understand what he is trying to say.